I saw on Abbie’s blog that Analise at Sugar*Sugar hosted a button challenge, asking bloggers to post photos of their buttons. I love my button collection, but after looking at some of the ones posted, my little guys look rather ordinary in comparison. Nevertheless, and despite missing the challenge, this afternoon I spent time that should have been spent working taking pictures of buttons. (This is not the first time I've done this, as shown by two of these bookmarks.) The sun was actually out today (I’m still in shock) so I was determined to do it outside, even though it was very windy and I ended up with shadows of my blowing hair in half the pictures. Some of my buttons blew right off the table and rolled off the deck. I’m sure my neighbors were wondering what the heck I was doing later, peering around the carport looking for lost buttons. So here they are, or at least here are the photos that don’t have hair shadows in them. Some of these buttons have lived in my button box for years. Some were recently bought on a whim, with no particular project in mind. 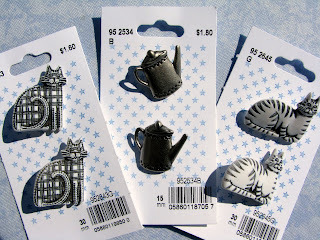 and buttons of many shapes. I don’t know much about their vintageness. Some were inherited from my great aunt and my grandmother and some were bought at thrift stores. Many are left over from completed projects and others were bought for projects that never quite got completed. Some were found on the street and others came as spares with shirts and sweaters or were cut off worn out clothing. Most of them are either fairly plain in style or were meant for kids’ clothes. 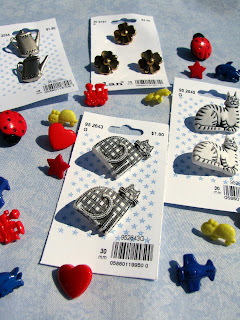 Compared to some, my collection of buttons is more utilitarian than fancy, but I like it anyway. It reminds me of past projects, of things I’ve made for my children, and of people I care about. Last Sunday we visited my parents. Our 11-year-old daughter was bored and complained to me that she had nothing to do. 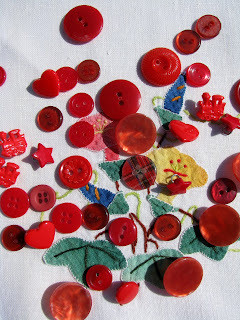 My mother brought her button collection to her, and the boredom was gone! 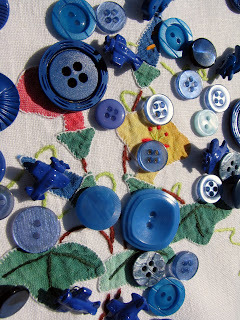 My daughter spent a long time happily sorting out different kinds of buttons, just like I used to do when I was a child. 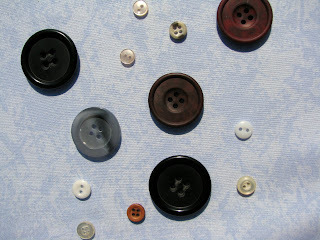 My mother's collection mainly consists of plain, ordinary buttons which have been cut off worn out clothes (of my grandparents etc.). But anyway, they are a lot of fun! And, of course, I couldn't keep my hands off them this time either! 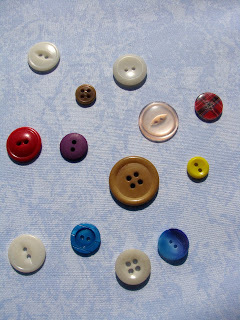 I think your buttons are fabulous! :) I love the shapes and the little airplanes! My children love to drag out the button boxes and sort, suffle and organize. I think it's going to be lots of fun and a great place to meet others! 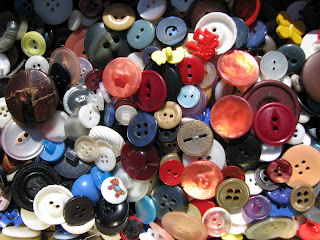 I know a button junkie when I see one :) Love all the shapes and colors. But I do have a pretty cool bead collection! Glad you are getting some sun and you are a great photographer!